A huge range of tools enables a sewer to measure accurately. Choosing the correct tool for the task in hand is important, so that your measurements are precise. The next step is to mark your work using the appropriate marking technique or tool. Some tools are very specific to one job while others are specific to types of sewing. Rulers There is 1 product. Sew Easy was first established by the Mason family of Sydney, Australia in the early 1980’s. Ann Mason had been a prominent ambassador in the stretch sewing revolution of the 70’s, where she was well known for her “Knit and Stretch” program which included her own book and patterns. Being an enthusiastic quilter, Ann then moved further into quilting and patchwork where she wanted to educate and provide fellow quilters with more practical rulers and marking accessories, making the past time easier and more enjoyable. Thus the Sew Easy range of rulers and measuring aids were developed and soon became a leading brand for quilting rulers and measuring products in Australia. 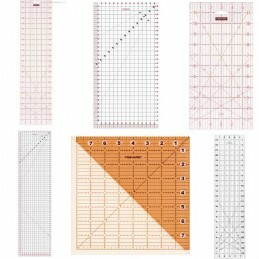 Today more than a million Sew Easy rulers are used throughout the World. Originator, Yoshio Okada’s invention of the OLFA Rotary Cutter in 1979 totally changed quilting techniques. Though originally designed for simply cutting fabrics, it played an important leading role in revolutionizing the world of quiltmaking with an extraordinary convenience that nobody imagined.